Drilling waste cuttings management equipment is more and more used in the drilling industry nowadays. The main cutting drying equipments are the vertical cuttings dryer, drying shaker and high speed decanter centrifuges the cuttings transferring system. According to the different base of the drilling fluids and the cuttings transferring equipment, the drilling waste cuttings management system has several layouts onsite. Almost the waste cuttings waiting for treatment are collected from the primary drilling solids control equipment like the shale shaker, de-sander, de-silter and barite recovery centrifuge. According to different transferring equipment, the different collection equipment would be used. If the user choose to use the auger as the cuttings delivery equipment, it is better to use the auger also as the waste cutting collecting equipment. The auger is located horizontally at the side of the solids control system mud tank; the length of the auger is decided by the mud tank length. The collected cutting was delivered to the drying equipment by another auger unit. If the user chooses to transfer the cuttings by using the slurry hose pump, then the cutting could be firstly collected by a hopper unit which is connected with a hose pump, the hose pump could transfer the cuttings to the drying unit through the hose. Using the auger would occupy much of the area of the drilling site, while the hose pump could be installed freely with less limitation of space. As per different base of the drilling fluids, the vertical cuttings dryer or the high G drying shaker would be chosen. GN’s modular design vertical cuttings dryer is the main cuttings drying equipment for oil base cuttings, the effluence out from the dryer is stored firstly in a intermediary tank, then the effluence will be pumped to the waste decanter centrifuge for polishing. The water base cutting mostly transferred to the high G force drying shaker for treatment. GN’s modular design drying shaker unit has a beneath located catching tank for drilling fluids storage and pumped to the centrifuge for further treatment. 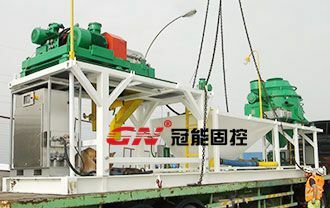 The decanter centrifuge could be installed on a telescopic skid, thus the active drilling fluids could flow back to the mud recycling system by gravity force. If the decanter centrifuge is installed on a low mud tank, then the effluence out from the centrifuge would first flow into the mud tank, and then pumped back to the mud recycling system.